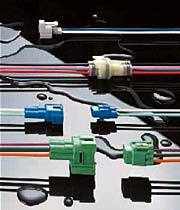 The MT sealed connector series, developed for connecting waterproof wiring, has 5 mm and 6 mm pitches between terminal poles. This series consists of a 2.3mm type classifi ed according to terminal size, supporting use in a variety of control circuits and low power circuits. -Perfect performance is ensured even when used in an automobile engine compartment. -A model that can be directly secured to a bracket on the car body is also available.